When Major Gryffth Hockaday is called to the front lines of the Civil War, his new bride is left to care for her husband’s three-hundred-acre farm and infant son. Placidia, a mere teenager herself living far from her family and completely unprepared to run a farm or raise a child, must endure the darkest days of the war on her own. By the time Major Hockaday returns two years later, Placidia is bound for jail, accused of having borne a child in his absence and murdering it. What really transpired in the two years he was away? To what extremes can war and violence push a woman who is left to fend for herself? Told through letters, court inquests, and journal entries, this saga, inspired by a true incident, unfolds with gripping intensity, conjuring the era with uncanny immediacy. Amid the desperation of wartime, Placidia sees the social order of her Southern homeland unravel. As she comes to understand how her own history is linked to one runaway slave, her perspective on race and family are upended. 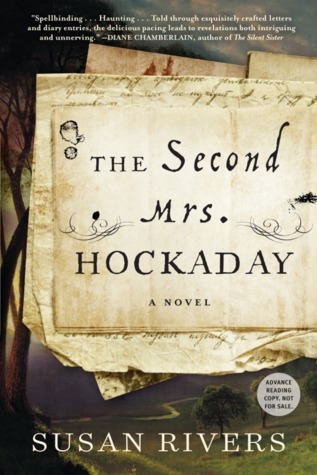 A love story, a story of racial divide, and a story of the South as it fell in the war, The Second Mrs. Hockaday reveals how this generation—and the next—began to see their world anew. This is one of those books that progresses so seamlessly that you marvel at the authenticity of it. In fact, Susan Rivers has said that the novel was inspired by her discovery of a mysterious crime in South Carolina during the Civil War, and she wrote her novel to make sense of it; once she started writing, the story poured out through these myriad voices. But because Rivers is also a meticulous researcher, every part of the story has some basis in fact. As in Hillary Jordan's Mudbound, you will feel that you're in the hands of a natural storyteller who knows how to breathe life into this period of history, the young Placidia, and all of the people around her. This is a remarkable, moving, and unforgettable debut. I’m going to be entirely honest and admit that I picked up Susan Rivers’ The Second Mrs. Hockaday because it looked absolutely nothing like The Sun King Conspiracy. I’d just finished the latter and I didn’t want anything to ruin the high I’d gotten off reading it so I intentionally looked around for something different. I’d an ARC of Rivers’ debut on hand and the description bore so little resemblance to the French intrigue that I thought it’d make a decent transition piece, but I was wrong. I was very, very wrong. The Second Mrs. Hockaday is a fantastic novel in its own right and I’m a little ashamed of having underestimated it. It’s a quick read, loosely based on real people and events, but powerful in both its depictions and themes. Set on the southern home front during the American Civil War, the novel digs into societal norms, expectations, race relations, crime, punishment, cultural destruction, love, loss, and survival. It’s an ambitious piece, tragic, but beautifully so. Fair warning to all, the mystery at the heart of the narrative isn’t pretty. There is nothing overtly graphic in The Second Mrs. Hockaday, but there are a handful of relatively dark scenes and lots of period appropriate language. I personally adored Rivers’ dedication to authenticity, but I know a lot of readers feel differently and caution that demographic to look elsewhere. Rivers writes with intensity and grit. She embraces the good, the bad, and the ugly within these pages and prospective readers should anticipate the sort of challenges that style and tone produces. Looking back, I’d have liked more closure regarding certain characters. Sukie, Agnes, Nerissa, Abner, and Roberta fade like ghosts into the backdrop of the narrative and I wish there’d been more definitive resolution to their roles. I also struggled with the format Rivers chose. The letters and diary entries are written by multiple characters and I constantly tripped over the transitions between each voice. Achilles Fincher Hockaday’s first letter, at the beginning of Part 2, is especially noteworthy in that it is nine pages told by a character that up until that point didn’t exist. I ultimately understood his role and importance, but in the moment I lost track of the story trying to sort out who I was following. Structural issues aside, I have to say that I greatly enjoyed the time I spent on this piece and would definitely recommend it to fans of Civil War fiction. We are no longer blessed with innocence, nor do we deserve to be. Paradise may have been lost, but paradise is a bad bargain. It costs too much. It conceals serpents, and is littered with graves.